Koalas are declining in rapid numbers because the trees where they spend a majority of their time are being quickly chopped down. Roads are being built where there were once trees, increasing the risk that the animals will be hit by cars. In addition, when houses are built in place of the trees that once covered the particular land, the animals are in greater danger of being attacked by the dogs of the people who now live in the newly built houses. Up here in Queensland and New South Wales, they’ve got koalas that are declining rapidly, population’s dropping off the face of the Earth right on their doorstep and we’re not able to do anything about it, seemingly. In South East Queensland, the human population is increasing by more than 1000 people a week. This rapid population growth and increased need for houses is placing considerable pressure on the limited remaining koala habitat. Currently, about 80 percent of the koalas’ habitat is almost completely ruined due to human encroachment. Only a small portion of this land is now protected. This is ironic when one considers that the koala is a protected species. 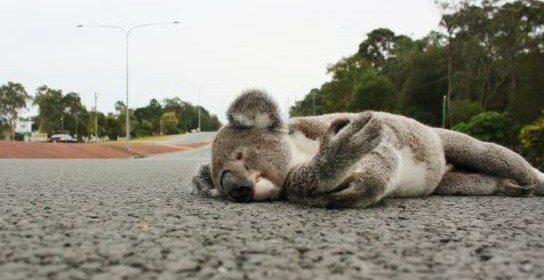 Yet, because the koala’s habitat is constantly being destroyed, about 4,000 of these animals are killed by cars and dogs every year. The human population of the narrow strip between Noosa and the Gold Coast – South East Queensland’s “200km city” – will swell by 2.2 million to 5.5 million in 30 years. It’s all part of the “big Australia” policy! That extra development will finally get rid of koalas in SE Queensland, something governments been working very hard to achieve for decades. Massive immigration coupled with a PM who doles out infrastructure funding not on need but only to those who follow his radical political ideology on asset sales. Urge officials to protect larger areas of the eucalyptus forests where these animals live in order to help save them. If we don’t do something now, koalas may soon have no place in the wild that solely belongs just to them. 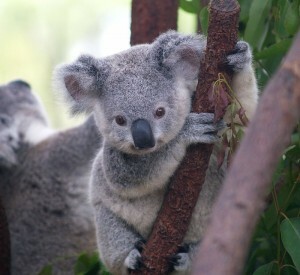 The Redlands koala population, estimated in 1999 to be 6,200 animals, has plummeted by approximately 75% (in 15 years). The koala was recently listed by your government as ‘vulnerable’ in Queensland with South East Qld suffering the greatest loss of koala numbers. Habitat loss (to property developers and infrastructure) is the greatest threat to the koala’s survival followed by disease, vehicle strikes and domestic dog attacks. Since European settlement, hundreds of species have become extinct in Australia, including at least 50 bird and mammal, 4 frog and more than 60 plant species. It is likely that other species have disappeared but without our knowledge. Many other species are considered to be threatened and are listed under Australian Government legislation as endangered or vulnerable. More than 310 species of native animals and over 1180 species of native plants are at risk of disappearing forever. As long ago as 1994 the Australian Academy of Sciences advocated a maximum population for Australia of 24 million, a figure we are fast approaching and will soon exceed. In 2010 the National Institute of Labour Studies at Flinders University looked at different levels of net overseas migration – from zero up to 260,000 p.a. – and found that all levels lead to worryingly unsustainable positions, which worsen the higher the levels become. We will have no habitat to sustain viable breeding colonies unless we leave the trees for koalas. Please reject the development application for the proposed North Maclean Enterprise Precinct at North Maclean, South-East Queensland which involves clearing 289 acres of koala and quoll habitat.